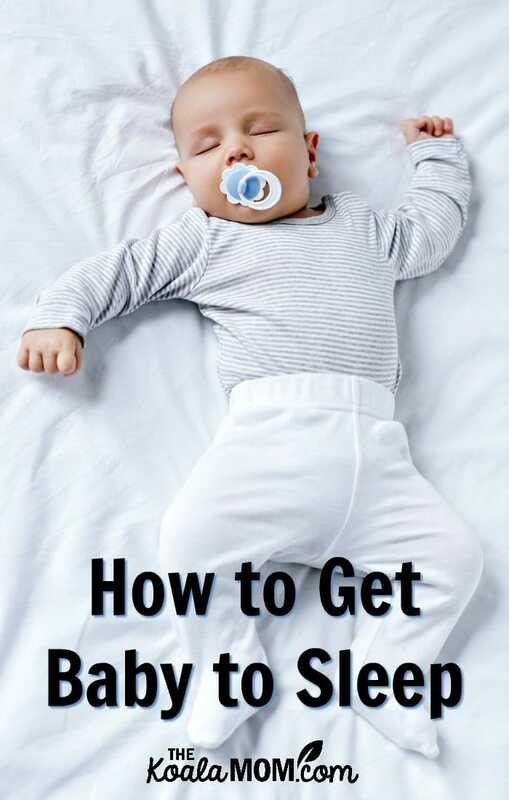 How to Get Baby to Sleep: Tips that Worked for Me! Getting baby to sleep can be one stressful. Before Jade was born, I found myself appreciating the bedtime routine we’d developed for Sunshine and Lily—and wondering how long it would take to get Jade into a similar routine. I remember many nights of bouncing, nursing, burping, rocking, and more as I attempted to get baby to sleep, often not succeeding until midnight or later. So far, Jade has been an easy baby. She’s had a couple nights that remind me of long nights with her older sisters—and what I learned about ways to get a baby to sleep, identifying sleep problems, and developing bedtime routines. Dr. Sears, author of The Baby Book: Everything You Need to Know About Your Baby from Birth to Age Two, explains, “Sleep is not a state you can force a baby into.” Anyone who has complained that he couldn’t get to sleep should understand that sleep can’t be forced. Instead, Dr. Sears says parents should “create a sleep-inducing environment that allows sleep to overtake the baby.” Consider what helps you get to sleep; you probably know things to avoid and things to do to fall asleep faster. Similarly, learn what helps your baby get to sleep. Many babies like being nursed before bedtime. Linda Folden Palmer, an expert for Mothering magazine, explains, “Babies are designed to nurse to sleep, and nurse back to sleep during night feedings snuggled up next to mom. (Babies can be nursed with a bottle, too. )” All my girls nursed to sleep. Sometimes just cuddling with a baby will lull them to sleep. Rachel Lister says, “Babies need to feel secure and being close to a parent is one of the most comforting things to an infant” (see “Establishing a Bedtime Routine“). Knowing Mom or Dad is near may be all it takes for baby to relax and drift into dreamland. I didn’t plan on co-sleeping before Sunshine was born, but that’s what worked to help get baby to sleep. Since then, we’ve co-slept all of our babies, for about the first year. Then I slowly transition them into their own bed. Swaddling can also help get baby to sleep. Wrapping a baby tightly in a receiving blanket mimics the secure feeling of being in the womb or in Mommy’s arms. Babies are also less lightly to startle and hit themselves with their little fists. A baby pillow could also help baby roll around less and feel more secure in her crib. If you feel you’ve tried everything to get baby to sleep and nothing has worked, try to identify problems. While babies go through phases where they wake more frequently (due to growth spurts or changing sleep patterns), frequent night wakings could also be an indication of something wrong. Check that baby is warm enough at night. Does he throw his blankets off or crawl out from under them while sleeping? Perhaps putting baby in a sleep sack will help keep baby warmer. Do loud noises, such as doors closing or toilets flushing, startle baby awake? Avoid these once baby is in bed. You can also use a white noise machine like a Cloud B Sleep Sheep in baby’s room to help cover any outside noises. Because we have a small house and lots of kids, I use a white noise machine frequently to help mask noise outside the bedroom so baby can sleep better. Does baby wave his arms around and hit or scratch himself in the night? Perhaps swaddling would help. Or maybe your baby, like my girls, prefers having her arms out and won’t sleep unless she can put her arms up above her head. A video baby monitor can help you watch your baby sleep and perhaps identify what is waking him up. You can also check the monitor to see if baby is really awake, or just talking in his sleep, before going into baby’s room. I’ve noticed my baby has cried out in her sleep, but then will settle herself again if I don’t go into the room. Following a consistent bedtime routine can help create that “sleep-inducing environment.” Baby has no sense of time, as adults do, but the routines of his day will communicate to him what comes next. Steven Schachter, a psychologist, explains that routines give kids “a sense of security in knowing what’s going to come up and they feel good about that. If things start to change, they get anxious” (quoted in “Sharing the Night Shift” by Tamar Satov, Today’s Canadian Parent, January 2009). While Schachter was talking about kids, routines work the same for babies and help establish habits that can continue into childhood. Now that Sunshine and Lily are five and three, I’m starting to see the results of routines we established when they were babies. As they get older, they become responsible for more of the routines themselves (like getting into their own jammies), but the steps from playing to bedtime haven’t changed much. Once you’ve figured out what works to get baby to sleep, and identified any sleep problems, create your routine. For example, I change baby into jammies, then nurse and rock her in my room with the lights dimmed and some white noise turned on. Either parent can do the sleep routine, and you can share it with grandparents or babysitters as well so baby feels comfortable when you are out. Were your children good sleepers or did they need extra help to drift into dreams? What helped you get baby to sleep? Great post, I love Dr. Sears! Oh babies are all so individual. I fully agree with Dr. Sears. My one dolly slept like the dead every night. She spoiled us. The other one never slept. The challenges were tiring them out and creating that environment that allowed sleep to take over. This is a helpful post. I love the names of your girls also by the way. So sweet! great post! my daughters were not very good sleepers! glad that’s all behind us now!